Catherina Palace is the most impressive, beautiful and unique building from the architectural ensemble of the Tsarskoe Selo complex, located 24 km from the former Russian capital Saint Petersburg. 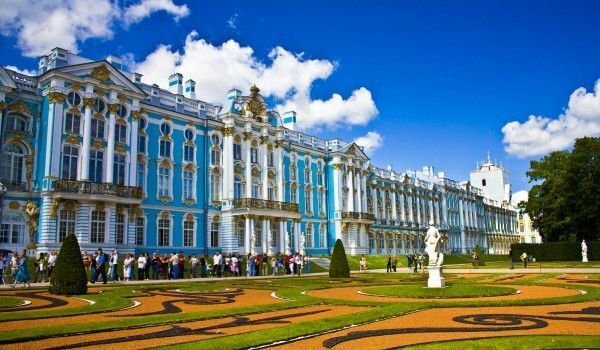 The palace includes in its area, the homonymous beautiful gardens which is a complete work and shining example of the Russian baroque architecture. Catherina Palace named Catherine I, was is the second wife of Peter the Great. Catherina the Great rules the Russian Empire for two years after the death of her husband. Originally founded as a modest two-storey building, commissioned by Peter to Catherine in 1717 the Palace owes its awesome majesty of the royal couple's daughter - Empress Elizabeth. She chooses the magnetic environment and atmosphere of Tsarskoe Selo, as its main summer residence. Started in 1743, the building of Catherina Palace was made by four different architects, while Bartholomeo Rastrelli was chief architect of the imperial court he did not receive the task to reconstruct Catherina Palace, making it a complete rival in grandeur of Versailles near Paris. The final version of Catherina Palace came to light in 1756. The magnificent palace was about 1 km in circumference, and impressed with the intricate blue and white decorated facades. The palace was also decorated with golden ornaments and the most detailed decorations that were made by German sculptor, Johann Franz Dunker, who also works with the chief architect on the original interior of the palace. A record 100 kg of gold had been spent on decoration and ornamentation of the exterior of the palace and that was only during the reign of Elizabeth. 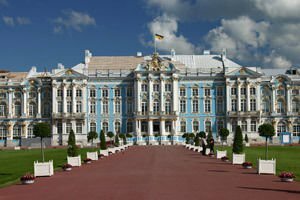 A little later, Catherine introduces new elements and reconstructed Catherina Palace, which did not prejudice the authentic look of the stunning facade, which is preserved to this day. During the occupation during World War II, the Nazis used the palace for barracks. Out of 58 ruined halls of the palace only 32 were restored. Extremely impressive in the interior of Catherina Palace is the Great Hall. Today, the biggest and most impressive room of the palace you can see as it is behind the two rows of windows that string along the long walls. Among them are placed high mirrors that are placed in beautiful and ornate gilt frames. Everywhere on the walls of the Great Hall are huge murals that depict Russian military victories and achievements in science and art. Another remarkable room in the palace is the Amber room. It is located on the north side of the parade staircase of the castle and its interesting name comes from the fact that its walls are all carved in the past with amber trim. The Amber Room was donated to Peter the Great by the King of Prussia in the Treaty of 1716. The lovely amber paneling, along with many other values of the palace disappeared during the Nazi occupation. In 1979 the Soviet government suspended the search for the Amber and under took restoration of the room. The restoration was completed entirely in 2003. Particularly impressive are the gardens of the palace. They are a unique blend of perfectly landscaped paths and scenic lakes. Everywhere around Catherina park there are scattered numerous marble statues, which are alternated with artificial waterfalls and various pavilions. Over the lakes were built bridges, and around them are set up nice piers. Quite interesting is the English Garden, where the gallery of Cameron is located.